Powers/Abilities: Sarnak did not possess any superhuman powers or fighting skills but he was a genius with electronics and one of the recording industry's greatest sound engineers. Paraphenalia/Weapons: Sarnak always wore an emerald mask to hide his (supposed) disfigurement. The mask covered most of his face except for the lower mouth/chin part but the shadow from his mask kept that part of his face unseen. Sarnak's one and only weapon was his control whistle (also called his control flute or command whistle), a device which enabled him to "control minds by reaching into the vibration pattern of the human and animal brain." Despite Sarnak's grandiose claims, his control whistle seemed to function solely by causing pain to its victims. Sarnak used his control whistle for three purposes: to enslave, to punish, and to summon. When he wanted to take control of someone, Sarnak would approach that individual and blow on his whistle to produce an ultrasound which he called "the command" that was close to the frequency of human (or animal) brain-waves. At close range, this ultrasonic tone would induce intense pain which typically rendered its victims unconscious for hours. Although this pain was temporary, "the command" had two other longer-lasting effects. First, people who had been exposed to it were somehow more sensitive to the control whistle's tone. Subsequent exposures generally felt more painful and victims would be able to perceive the ultrasonic summoning tone at great distances. Sarnak claimed that this was because his device was now "synchronized with (his victim's) brain-waves" (but it seems more likely that the ultrasound had somehow altered the brains of its targets instead). Second, "the command" apparently induced in its victims a sense of powerlessness which made them feel incapable of resisting Sarnaks's commands, resulting in them becoming obsessively obedient to him. Unlike the pain, both of these effects seemed to be permanent (unless counter-acted). Sarnak also used "the command" to punish his slaves when they disobeyed him or when they failed in the tasks he had given them. The pain and unconsciousness induced by the control whistle's punishment was temporary and when those who had been punished awakened they were "better than before" (i.e., even more eager to obey Sarnak). Sarnak could also use his control whistle to summon his slaves to him from a distance. This ultrasonic tone could (usually) only be perceived by those who had previously been "synchronized" by the control whistle. This summoning was effective over significant distances and did not induce pain or unconsciousness in Sarnak's followers. This fact suggests that the control whistle may have been able to produce a second ultrasonic tone, one that was different from "the command." 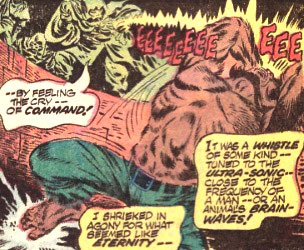 However, it should be noted that the Werewolf was able to perceive Sarnak's summons even without close-range exposure to "the command" and that the summons affected him just painfully as "the command" did. This was presumably due to the fact that the Werewolf's sense of hearing, like his other senses, was enhanced compared to that of normal humans. Sarnak's control whistle was vulnerable to a Model M-17 Sonic Screen device which was able to "blot out" sound in the upper frequencies (presumably by an effect called destructive interference) and thereby mask the whistle's effects completely. Aside from being able to prevent the control whistle from inducing pain in anyone in close proximity to it, exposure to the sonic screen's waves apparently reversed the sensitization caused by the control whistle and seemingly erased the lingering sense of powerlessness that had been induced by the whistle. As a result, victims soon realized that they were no longer under the control of the whistle...or of the person who had wielded it. (Werewolf by Night I#10 (fb) - BTS) - Sidney Sarnak was one of the recording industry's greatest sound engineers, a genius in electronics and a living legend among his fellow professionals. At some point, Sarnak became involved in producing illegal copies of popular albums but was caught. He tried to escape but was injured in an accident and scarred for life. Sarnak used the months he spent recovering to study sound and he developed a device which gave him the power to control minds "by reaching into the vibration pattern of the human and animal brain." Sarnak then contacted the Committee (or they contacted him?) and volunteered to help them by using his control whistle to create an army of fear. (Werewolf by Night I#10 (fb)) - Now wearing a mask and costume to conceal his disfigurement, Sarnak was brought to the monthly meeting of the Committee by Carruthers who introduced him to the other members and revealed that he had volunteered to aid them by using his control whistle to create an Army of Fear. Sarnak was then given dossiers on Jack and Lissa Russell which indicated that they were werewolves and Carruthers told him that it would be his job to capture them and use them to create terror. When Sarnak asked why they wanted him to create terror, the Committee told him that they believed that consumers were not buying because they were too secure and that creating terror would shock consumers back into an awareness of their immediate interests (i.e., a climate of fear would stimulate the economy). (Werewolf by Night I#9 (fb) - BTS) - Sarnak began to create his Army of Fear by seeking out "the dregs of society, the hopeless bums, the men whose lives have been dissolved by the acid of despair, the derelicts, the drunks, the vagabonds - diseased without and within, all but lost to the human race." Sarnak used his control flute/whistle to condition these people so that they would bow to his every whim...or they would be punished. (Werewolf by Night I#9 - BTS) - Sarnak sent one of his Army of Fear, a derelict later known as Tatterdemalion, to follow and capture the Werewolf. After trailing the Werewolf for hours, Tatterdemalion finally emerged from the sewers and attacked him. The resulting battle was interrupted by Sarnak's ultrasonic whistle which called Tatterdemalion to come to him. Tatterdemalion obeyed immediately, not realizing that the ultrasonic whistle had incapacitated the Werewolf who passed out seconds after his foe left. (Werewolf by Night I#9 - BTS) - The next evening, Sarnak sent his Army of Terror to the Russell home to kidnap Jack Russell but they arrived and attacked only seconds before the moon rose and Jack changed into the Werewolf. After a brief battle, Sarnak's ultrasonic whistle knocked the Werewolf out again and summoned the derelicts to bring him to Sarnak's base in the sewers. (Werewolf by Night I#9) - Later that night, Sarnak was pleased when the Werewolf woke more quickly than he had expected. To establish his mastery, Sarnak provoked the Werewolf into attacking him, then used his control flute to induce intense agony in the Werewolf, stunning him. Believing that his control flute was now synchronized with the Werewolf's brain-waves, Sarnak was surprised when the Werewolf tried to attack him again but he simply used his control flute to induce even worse pain in the Werewolf after which the beast offered no further resistance. Sarnak then led his Army of Fear and the Werewolf to Century City and had them attack anyone they saw. During the attack, Lissa Russell was captured and the Werewolf was again knocked out by the control flute when he tried to defend her. Sarnak then led his army and their captives back into the sewers. 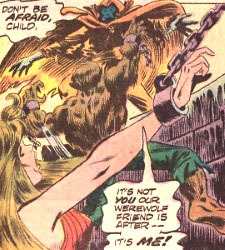 (Werewolf by Night I#10) - Sarnak had both Lissa and the Werewolf chained in a pit in the sewers, then told Lissa about himself and how the Committee had hired him to kidnap them and to use his control whistle to create terror. After Sarnak left them alone while he and his men went to get food, the dawn caused the Werewolf to change back into Jack who freed himself and escaped to get help for Lissa. After discovering that Jack had escaped, Sarnak led his army in an attack on civilians and police in downtown Los Angeles, then retreated. At dusk, as Sarnak led his army back into the sewers, he was spotted by Jack who then followed him below as the Werewolf. As the Werewolf battled the derelicts, Sarnak attempted to use his command whistle on him but found that it didn't work because the Werewolf was wearing a sonic screen device that Jack had acquired. Sarnak was overcome by the Werewolf who then freed Lissa from the pit. When the army of derelicts regained consciousness, they discovered that (as a result of their exposure to the sonic screen device?) they were no longer under Sarnak's control. 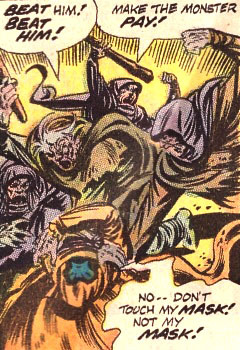 Enraged by how Sarnak had used and hurt them, the derelicts attacked their former master, beating him to make him pay for what he had done to them. During their assault, the derelicts grabbed Sarnak's mask, causing him to cry out, "No -- Don't touch my mask! Not my mask! NOT MY MAAASSSKK!" His victims, naturally enough, ignored his pleas, removed his mask (revealing his UNscarred face) and continued to beat him. Finally, once they were finished with him, Sarnak was in a state that even the Werewolf found sickening. The derelicts left Sarnak sitting alone in the sewer, either dead or catatonic and left for dead, with his mask lying by his side. It may be that Sarnak was actually beaten to death by his vengeful former slaves but this has never been confirmed. Comments: Created by Gerry Conway and Tom Sutton. Jack Russell's final thoughts on this character: "The secret of the man called Sarnak was not in what he thought was a scarred and misshapen face but rather in what he'd made of his immortal soul which no man may hide from himself - - not even behind such a finely wrought, such a wonderfully simple emerald mask." 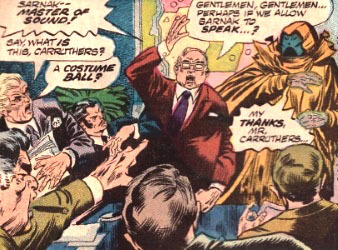 This character's full real name, Sidney Sarnak, was first revealed in the entry on Tatterdemalion which appeared in the Official Handbook of the Marvel Universe I#10 (November, 1983), published ten years after Sarnak himself last appeared in any story. Sarnak was supposedly scarred for life when he was injured while escaping (from the police?) and it was to conceal his disfigurement that Sarnak always wore a "finely wrought emerald mask." However, when he was later unmasked, it turned out that his face wasn't scarred at all. Also, Sarnak's hands did appear to be very scarred and deformed but, considering his apparent psychological problems, it may be that he was just wearing gloves that looked like scarred hands. The Committee's stated reason for why they wanted Sarnak to capture a werewolf was later revealed to be false when one member of the Committee complained to Baron Thunder that "we of your Inner Council don't even know the real reason we hunt Russell - - only the inane psuedo-economics we foist off on flunkies, like Sarnak!" It wasn't until Baron Thunder was battling the Werewolf himself that it was revealed that Thunder wanted the Werewolf's blood to "strengthen the other members of the Committee as (Thunder had) been strengthened!" The identity of the creator of Sarnak's control whistle is uncertain. When he met with the Committee, Sarnak claimed that he had developed the device but he later told the Werewolf that "those men who created the control flute (were) the Committee." Given how megalomaniacal Sarnak was, it seems unlikely that he'd exhibit any false modesty concerning his achievements. Maybe the Committee financed his research and that's why he alluded to them as having "created" his command whistle? 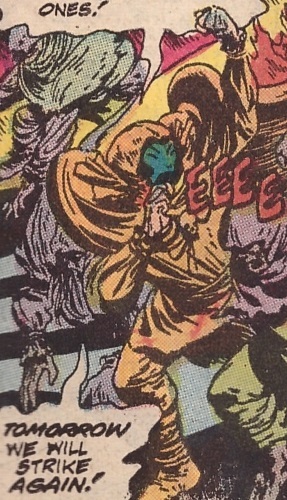 Over the course of this two-issue storyline, five different terms were used to refer to Sarnak's group of unwilling warriors, none of which were used twice. Carruthers called them "an army of fear" while Sarnak himself used four terms: Army of Terror, Household of Horror, Team of Terror and Legion of Fear. The term "Army of Terror" was the term Sarnak used first but "Legion of Fear" was what Sarnak called them in public, during their attack on downtown Los Angeles. In the real world, according to Wikipedia, "ultrasound" is simply "sound waves with frequencies higher than the upper audible limit of human hearing" and is otherwise "not different from "normal" (audible) sound in its physical properties." Healthy, young adult humans can generally hear frequencies up to 20 kilohertz, and ultrasound devices operate with frequencies from 20 kilohertz up to several gigahertz. Sonic weapons which use sound to injure, incapacitate or kill their targets are used by military and police forces. These weapons can be used to cause a variety of effects, from inducing feelings of nausea or discomfort up to destroying a target's eardrums. Howeever, none of them (as far as I know) as whistles which can be held in one's hand. or to any other Army or fear group. A group of (at least twelve) men (and women?) whom Sarnak felt were "the dregs of society, the hopeless bums, the men whose lives have been dissolved by the acid of despair, the derelicts, the drunks, the vagabonds - diseased without and within, all but lost to the human race." Sarnak used his control flute/whistle to condition these people so that they would bow to his every whim, and then used them to create his reign of terror. (Werewolf by Night I#9) - One of the derelicts (later known as Tatterdemalion) was sent by Sarnak to find and capture the Werewolf but after finding his target and engaging him in battle he was forced to retreat when Sarnak summoned him with the control whistle. The following evening, the army of derelicts was sent by Sarnak to the Russell home to kidnap Jack Russell but they attacked him a bit too late and soon found themseves facing the Werewolf. During the battle, Sarnak's ultra-sonic wail was heard, calling the army to return to him but also knocking the Werewolf unconscious. Taking advantage of this, the army brought the Werewolf with them to Sarnak in the sewers. Later, the Army of Terror (which now included the "tamed" Werewolf) was led by Sarnak to Century City where Sarnak began his reign of terror by commanding his army to attack anyone they saw. When some of the army attacked Lissa Russell, the Werewolf leapt to defend her but was again knocked out by Sarnak's control flute. The army then obeyed Sarnak's order to take their captives (Lissa and the Werewolf) below with them as they returned to the sewers. (Werewolf by Night I#10 - BTS) - The army brought Lissa and the Werewolf to a pit somewhere in the sewers and chained them both to the pit's walls. (Werewolf by Night I#10) - Some of the army stood nearby while Sarnak told Lissa about himself and why the Committee had hired him to capture them. When Sarnak and his army left to go get food, one of them was left behind to make sure that the captives stayed in the pit but Jack was able to defeat him and escape. 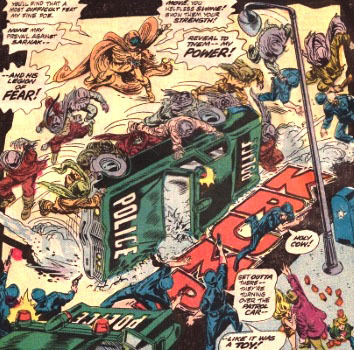 Later, after Sarnak discovered Jack's escape, he rearranged his plans and had the army come up from the sewers into downtown Los Angeles where they attacked civilians and police until Sarnak ordered them to retreat and regroup. That evening, Sarnak led his army back into the sewers, unaware that they were being watched by Jack who soon followed them below as the Werewolf. The Werewolf quickly reached the pit in which Lissa was chained and fought his way through the army to reach Sarnak whose attempt to use his command whistle failed because the Werewolf was wearing a sonic screen device that Jack had acquired. When the army of derelicts regained consciousness, they discovered that (as a result of their exposure to the sonic screen device?) they were no longer under Sarnak's control. Enraged by how Sarnak had used and hurt them, the derelicts attacked their former master, beating him to make "the monster" pay for what he had done to them. During the beating they removed Sarnak's mask, causing him great distress. Eventually, when they had finished, they departed, leaving Sarnak either dead or catatonic.